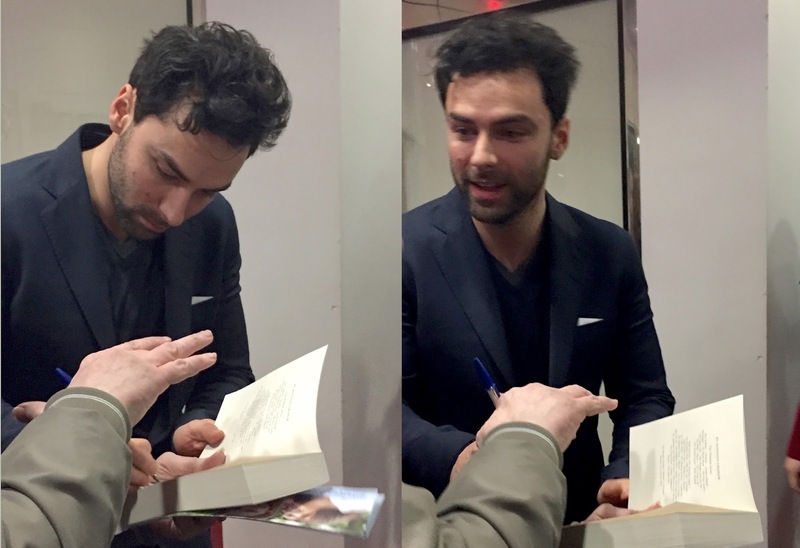 Last week I attended a screening of an upcoming BBC television series called Poldark, followed by a Q&A session with two of the lead actors, Aidan Turner and Eleanor Tomlinson. The series is based on the novels by Winston Graham and has previously been adapted for television in 1975, making this version a remake. It tells the story of a British Army officer in the 18th century named Ross Poldark, who returns home to Cornwall from the American Revolutionary War to find that everything he had previously known has changed. 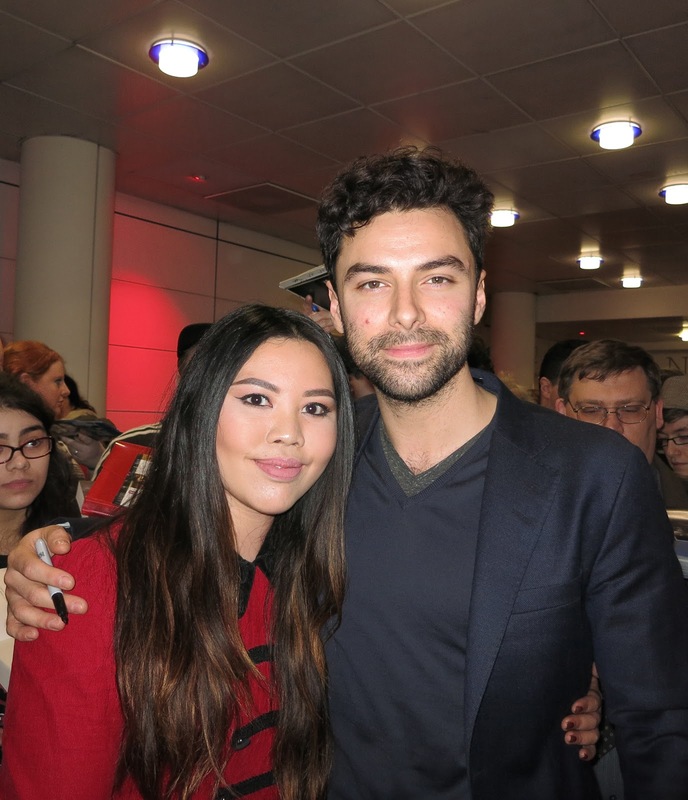 The screening of the first episode was held at the BFI Southbank in London and my friend and I were lucky enough to get seats on the front row as well as meet Aidan and Eleanor. For the Q&A, the actors were also joined by writer and producer Debbie Horsfield and director Ed Bazalgette, and here's how it all went down (warning: slightly spoilery in places). What was your starting point when you were considering how you were going to play Poldark? 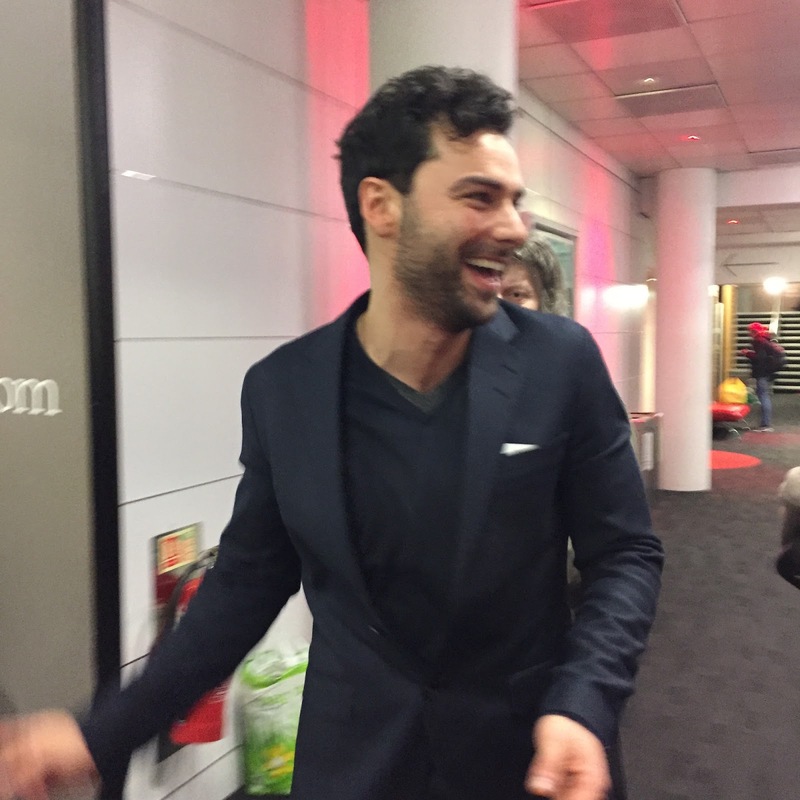 Aidan Turner: My starting point was kind of the end point all the time. I just kept going back to the books and to the script. You can find the inspiration from different places and different sources, they're all really useful and enjoyable. I had a couple of months before we started shooting to research and to discover this character, but it just keeps going back to the script every time. Is your Ross and your Demelza the script's version of the characters or the books' version? AT: I don't think there's a massive divide between them. My reference most of the time would be the script but of course the books come into play. I was reading the books as I was reading the scripts from the beginning, I think when the offer came in for me to play the role, I got six of Debbie's scripts and the books in the same day and I thought "Bloody hell"! I googled like "What the hell is Poldark?" (laughs) and I called my mum and she was like, "You better not mess this up!" I'd read scenes with friends and was always coming back to the script and especially the early episodes, just to find his voice and through that, his physicality and different things. Did you sometimes just think, "I'll just stand and look gorgeous, that'll do"? Did you at any point, practice in the mirror, your Poldark pout? AT: I'm pouting quite a bit, I've just realised! There's a lot of eyebrows going on! AT: I think that's just naturally what I do, I mean look at these eyebrows. They're there for frowning. No, I generally don't think about those kind of things, I really don't. It's just, they seem to happen and they give themselves their own life. Did you watch any of the original Poldark television series? AT: I didn't and that was obviously a conscious decision because I think they're on Youtube and they're pretty accessible... not that Mammoth wouldn't give me copies if I asked for them. I just decided to find it myself and see what I'd come up with. I was afraid more so of subconsciously or unconsciously emulating Robin (Ellis)'s brilliant performance. I felt like I had enough material anyway, Winston (Graham)'s given so much in the novels and Debbie's adapted them so well, I just didn't feel the desire to go anywhere else. If I did, I would've done. What can we expect from your version of Poldark, what sort of man is he going to become? AT: He's a contradiction of a lot of things, I think he's quite conflicted. In this first episode, it's a great place to start for a character, it's a dream for an actor to start off in that position where the character comes back to town with the place completely changed in his eyes. The one thing bringing him back was his beloved but then it's ruined. But he's strong, I think many weaker men would have galloped to London, there's nothing to hang around for it seems but I think Ross Poldark knows his roots are in Cornwall and I think he believes that he's the only person who can really save it, there's a lot of people dying and need work and he's in a position to do something about it and I think he feels that responsibility. He's also a bit of a rebel. He's a bit of a Russell Brand of this day! AT: The hair is similar! So Eleanor, let's talk about Demelza. In terms of the characters who go on a journey, you've got the biggest one to go on, haven't you? Eleanor Tomlinson: Yeah, absolutely. Boy, episode 1. Married, with child, episode 5. ET: Amazing role, I've always said it's the Scarlett O'Hara of roles. They just don't really come along for actresses and I leapt on it. She's the emotional heart of the show isn't she? Did you feel any weight of expectation playing her, given she's such an iconic character? ET: Yeah, massively! When I first hear they were making it, I may have spoken to my parents and they went "Oh my god" but I then didn't want to watch the original series too much but at the same time, you'd be stupid to ignore Angharad Rees. She managed to capture the heart of the public like she did and so I watched bits of it, in order to try and capture that with my own portrayal of Demelza. But yeah, it was a lot of pressure and I'm really nervous about it coming out! I heard that you pulled out all the stops to get the part! What specifically did you wear? ET: It was a jumper! A very baggy one and I remember him being so pissed off that he wasn't allowed to wear his own Christmas present, that I was going to an audition with it, but yeah I wore kind of army boots and just refused to speak to anyone for the entire audition and kind of kept this gormless expression on my face. I'd never really done that before either, I don't know what came over me but it must have worked. Edward Bazalgette: The moment I saw that jumper! (laughs) No, it was a wonderful moment. She came into the room and she was Demelza. It was a joyous experiences. They are just so giving and fearless. Let's talk about what it looks like, because you've made it look incredibly cinematic. Part of that will be down to Cornwall which is very much a character in its own right in the show. One of the things I kept wondering about was that obviously a lot of action is happening on cliff edges, what logistics of getting a film crew up coastal paths, they're not easily accessible? EB: It's moments like that when you think, "Is this good?" but it's a beautiful scene. Or shallow water at the very least! DH: It was quite calm that day wasn't it? (To Aidan) You had to like, splash water on yourself. So if you're thinking of doing a period drama, as the director, is your first inclination to always be 100% tuned to the period? Or are you looking at ways to make it relevant for modern audiences? EB: Winston Graham chose a very specific point in time to set the story which is key to what's going on. But you've got this kind of contemporary resonance that's there in the script so I think, taking that forward and there's so much energy and life that Aidan, Eleanor, and the rest of the cast bring. It's really just a case of representing that and there's something about Cornwall, something about Debbie's scripts that says no formality. Since the period drama genre has a lot of important movies and series, what do you think sets Poldark apart? DH: I'm a great fan of Jane Austen. What sets Poldark apart for me is that you get all of the delicate nuances of relationships and traditions like balls and tea parties but you also get massive set pieces like riots. There's a huge scale to it. I think you get the best of everything really. EB: I would just say, time and place. Cornwall back then, is an untold story with fascinating history, but it's not a history lesson, it's a wonderful drama and it's articulated through the characters beautifully. Aidan, what do you admire most about Ross Poldark and what would you change about him? AT: What do I most admire? His strength. He's strong, he's resilient. He's default position is to help people, which I quite like. He suffers in spite of himself. He doesn't feel sorry for himself if he's down about something. He's got a lot of grit, he can pull himself up by his boot straps and get on with something, he doesn't wallow. He's a real old school, iconic hero. I don't know if I would change anything about him, I'll think about that one. Do you ever feel stressed before filming? DH: Well it would because you had like, no days off! AT: I was quite fearful of that because that was out of my control. Anything I can't control, I get quite nervous about because things like that can just happen. In regards to playing the part though, not really, just hoping everything goes okay. Is it safe to ask something that isn't to do with Poldark? Interviewer: Is it to do with The Hobbit? Interviewer: Go on then, you can ask. (laughs) No, you can ask about The Hobbit. Aidan, have you heard anything about going back to The Mortal Instruments? AT: Do you know what? It was only a couple of days ago, I saw an article somewhere about Jamie Campbell Bower and it said he was going back to shoot the sequel of The Mortal Instruments and I hadn't hear a bloody thing! DH: You might not be available! You're in a lucky position as actors, to be able to go into both film and television. It seems to me that now television is a much better format to really tell stories properly and develop character. How do you feel about that? ET: I think they're making some fantastic television series now, it is the age of television. A lot of your films aren't as strong as your television scripts. I think there's a luxury when you're working on film with time and budget. With a television series you don't have that, it's quick and you have to trust in your cast and your director and it's pretty stressful but I think it's the way forward. AT: I think it depends whether you're playing a lead role or not. I just finished a film in Ireland where I was on for ten days and it was weird to step on set every day to a crew that I know but haven't clicked with properly because you don't really get the time and you might do one day on and three days off, it's so sporadic and all over the place, it's hard to really get into it. This is a six month shoot, it's hard to compare the two. To invest a character over eight scripts is different to something that's only ninety minutes long. You both mentioned reading the books, how far ahead did you read? Did it influence the way you portrayed the characters in the beginning, knowing their trajectory? Is there a particular scene that was memorable during that shoot? AT: There's loads. There is a scene when Demelza's searching through one of Ross' trunks and finds a dress that used to belong to his mother right? (laughs) Nah he wears it to clean up the house... and Ross doesn't take too kindly to that gesture, that scene I quite like, it's quite emotional. AT: That never happened! That simply didn't happen, she's lying. I've been asked about my thoughts on the first episode and it's honestly a little difficult without spoiling anything but what struck me most, is that Poldark has been beautifully made and the cinematography is gorgeous in combination with Cornwall's breathtaking scenery. If you are a fan of Aidan, you will most definitely enjoy it, the camera seems to love him with lingering close up shots of his face probably making up a good fifty percent of the episode (some of them totally unnecessary in my opinion, but I've no doubt that most people will have no objections). The episode seemed to move rather slowly but that's to be expected with introductions and it has definitely set everything up for more exciting storylines to come. We were also shown an extra preview of the rest of the series (not the trailer) and I have to say that short snippet has piqued my interest even more. It looks like this new series will be an incredible mix of drama, action and romance and I'm quite certain that we won't be let down. Poldark starts this Sunday 8th March on BBC One at 9pm. this is so interesting, lovely post!